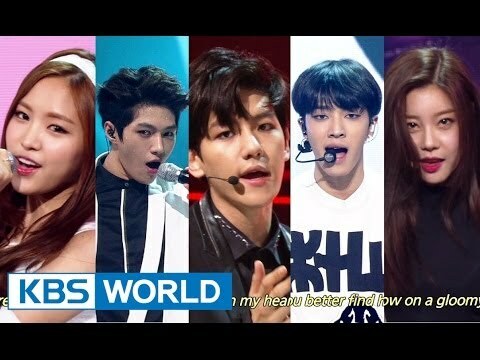 Music Bank( Korean : 뮤직뱅크) is a South Korean music television program broadcast by Korean Broadcasting System, KBS . It airs live every Friday at 6:10 PM KST. It is currently hosted by Lee Jang-woo and UEE . As of 2011, it is broadcast in 72 different countries through KBS World , owing to its popularity of K-pop in foreign countries. K-Chart is the countdown charts of Music Bank. The charts are calculated by combining the Digital Music Charts (65%), Album Sales (5%), Number of times broadcast on TV/Radio (20%), and Viewers Choice Charts (10%). The Top 50 songs of the week are featured on the show, where the Top 21-50 songs are shown via marquee and the Top 20-3 songs are featured by the hosts. The hosts then showcase the Top Two songs and announce who will be the winner of the week. The Number 1 song on the chart is the winner of that week's chart and receives an award. During the last week of June, the Music Bank First Half 1st Place award is awarded to the most popular song of the first half of the year. During the last week of December, theMusic Bank 1st Place award (or Music Bank MVP in 2008) is awarded to the most popular song of the entire year. Prior to the combined K-Charts, category-based charts were used. From September to December 2007, every week a different category (Digital Music Charts, Karaoke Charts,Viewers Choice Charts, Album Sales Charts) was featured. Technically, each category would only be featured once a month. It was similar to K-Chart except the results each week could only be based on a specific chart, and not all the charts combined. From January 2008 to April 2009, two charts were used. Every week, the Digital Music Charts and Album Sales Charts were used, and at the end of the month were the combined charts (Album Sales Charts (20%) + Digital Music Charts (50%) + Viewers Choice Charts (30%)). In May 2009, this was abandoned for the combined charts featured every week. 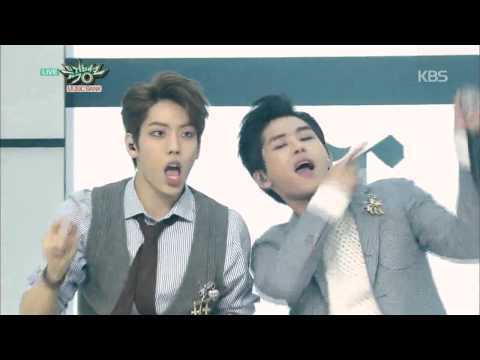 // [HIT] 뮤직뱅크-INFINITE H - 어디 안 가 + 예뻐(Go Nowhere + Pretty).20150130 0 views runtime : 0:05:30 INFINITE H - 어디 안 가 + 예뻐(Go Nowhere + Pretty)..